Detroit Lions Legend Wally Triplett, who left his indelible mark on National Football League history by becoming the first African-American player to be drafted and play for an NFL team, passed away earlier today at the age of 92. 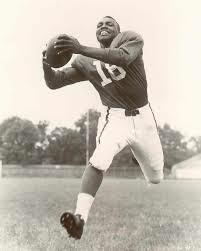 Triplett was a 5-11, 173-pound running back and return specialist for the Lions from 1949-50 after being drafted by the club in the 19th round of the 1949 NFL Draft. In his rookie season, he set the team record at the time for longest run from scrimmage with an 80-yard TD at Green Bay on October 30, 1949. Perhaps his most memorable on-field achievement occurred on October 29, 1950 at the Los Angeles Rams when he produced one of the most impressive special teams performances in NFL history. Triplett would set a League single-game record with 294 yards on just four kickoff returns, including a 97-yard touchdown. Along with his 97-yarder in the second quarter, he also registered returns of 74 and 81 yards in the first half. His final kickoff return in the third quarter netted 42 yards. His 294-yard effort stands as one of the Lions’ longest-lasting single-game individual records in team history. This record lasted as an NFL-best for 44 seasons before it was broken in 1994, and it still ranks as the third-highest single-game mark in NFL history. Triplett’s astounding kickoff return average of 73.5 yards in that game is still an NFL single-game record. On November 15, 1950, a little more than two weeks following his record-breaking effort, Triplett was assigned to the 594th Field Artillery Battalion after being drafted into the U.S. Army. He would serve two years during the Korean War. Following his service in the military, Triplett finished out his NFL career with the Chicago Cardinals from 1952-53. Triplett was a trailblazer even before he entered the NFL. A three-year letterman at Penn State, he became the first African-American player ever to start for the Nittany Lions football team. He was the first African-American to play in the Cotton Bowl in 1948, and he went on to catch the game-tying touchdown in Penn State’s 13-13 tie with Southern Methodist University. He was inducted into the Cotton Bowl Hall of Fame in 2018. During his final three seasons at Penn State, Triplett was instrumental in the team registering a record of 23-3-2, which included an unbeaten record of 9-0-1 in 1947. He still resides in the Penn State record books for the fourth-longest punt return (85 yards) in school history and is listed second on the career list for punt return average at 16.5 yards. A native of La Mott, Pa., Triplett was a three-sport athlete in high school starring in football, basketball and baseball at Cheltenham High School. He was the fifth of six sons born to Mahlon and Estelle Triplett on April 18, 1926. Wally is preceded in death by his wife, Leonore (Bivins) Triplett, and son, Wallace Triplett. He is survived by children Nancy, Alison and David, grandchildren Ayanna (Rob), Amber, Cory, Francis, Brandon and Arron, and great-grandchildren Kennedie, Robert Andrew Wallace, Jordan, Naomi and Ryan.